View More In Event Planning. Benefiting America’s leading center for the research and treatment of cancer, this is an invitation to a year’s worth of fabulous fetes hosted by New York’s most celebrated party-givers and fund-raisers. 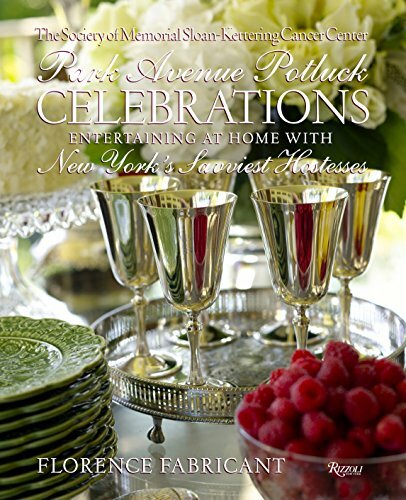 Taking the reader to some of the most glamorous private homes in Manhattan (and in the country), Park Avenue Potluck Celebrations showcases the unique élan and elegance these ladies bring to entertaining—be it a glittering New Year’s Eve or an al-fresco lunch on the terrace. From the mint juleps kicking off Derby Day to the Spanish Christmas cookies by the fireplace, these hostesses offer easy ideas that anyone can achieve at home. These ladies show that taste is all about how you put things together—on a tabletop, in a vase of flowers, with handmade invites. It’s these small touches, and the generous spirit behind them, that will inspire readers everywhere. The recipes they’ve chosen are tried-and-true crowd-pleasers that are guaranteed to be down-to-earth dishes you’d be proud to present at any occasion.